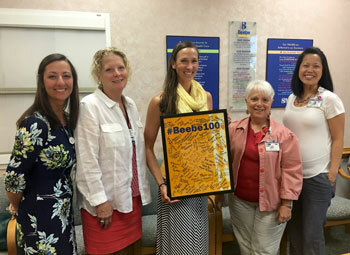 Beebe Healthcare 100th Anniversary Committee members gathered to thank Kelly Serpico, a local Zumba™ instructor, who helped Beebe team members learn a Flash Mob choreography routine. The Flash Mob surprised the crowds in Bethany Beach in April. The committee members surprised Serpico with a framed Flash Mob t-shirt signed by all the mobbers and a framed photo of the group. Tara Simpson, Manager, Organizational Development at Beebe, and Co-Chair of Team Member Engagement Committee for the 100th Anniversary, said "Kelly won us all over. She was our leader and we couldn't have done this without her." Kelly led more than 30 practices with Beebe team members after hours and around their work schedules to produce an in-sync routine that was unveiled for the first time on a sunny and breezy Spring day in downtown Bethany Beach. Her dedication to the Flash Mob made it a huge success. “Her volunteerism is appreciated and we were honored to be able to thank her with a shirt signed by the whole dance squad,” Simpson said. Andrea Hanna, Administrative Secretary for Case Management and Patient Experience at Beebe, and Co-Chair of the 100th Anniversary Flash Mob Committee, said, "People who were reluctant to join a flash mob group were inspired by Kelly. She made everyone feel comfortable and made adjustments accordingly. She is an energetic, fun, encouraging, and motivating instructor. She made everyone feel great!" Serpico also hosts free Zumba™ classes every Wednesday at 6 p.m. at Canalfront Park in Lewes. Her dedication not only to Beebe, but to the community, shines through. Serpico said, "It was my pleasure, I enjoyed every minute. I was a soccer player, and played at UD and only started dancing in my adult life. Anyone can learn to dance. If people are looking for a fun way to exercise, Zumba™ is the best!" Be on the lookout this Fall for the Beebe Flash Mob to pop up again...you never know where it might happen! Serpico is a licensed Zumba™ instructor who has been teaching for six years. She teaches locally and hosts both group and private classes. This summer she will also be teaching Barre classes at Coastal Dance Academy in the Villages of Five Points. For more information, go to www.kellyserpico.zumba.com. Beebe Healthcare is celebrating its 100th Anniversary in 2016. For more information on upcoming community seminars and events, go to www.BeebeHCE.org. Shown (left to right) are Tara Simpson and Jeannie Wallo, 100th Anniversary Team Member Engagement Co-Chairs, Kelly Serpico, local Zumba™ Instructor and Volunteer Choreographer for Beebe's 100th Anniversary Flash Mob Project, and Andrea Hanna and Kelly Mills, Co-Chairs for the 100th Anniversary Flash Mob Project.